Swagmen often didn’t need to navigate “properly” since they followed tracks and roads the bulk of the time. In unfamiliar areas they relied upon directions from other swaggies and from station workers and other locals they might run into and stop to yarn with along the way. In some areas the roads were little more than kangaroo or cattle pads so the swaggie usually had a working knowledge of direction-finding via the sun and the stars as well as other natural cues. The swag-carrying bushwalkers such as those from the Mountain Trails Club who swagged their way for weeks on end through the dense, trackless expanse of what is now the Blue Mountains National Park, needed to know how to use the map and compass, but since theirs were often the first European feet to set foot on much of the country they trod and much of it was largely unmapped, they also used the lay of the land to navigate. Some of these old time bushwalkers, such as Myles Dunphy, took the opportunity to actually map some of these areas. The sun was the most commonly-used direction-finding aid for those travelling without a compass. Since most bushmen carried a pocket watch, it could be used to find north in exactly the same way we today might use our analogue wristwatch. The 12 was pointed at the sun and halfway between the 12 and the hour hand is true north. This method can be inaccurate in far northern Australia where the sun can be directly overhead and can even be to the south during the wet season. Finding true north in the Southern Hemisphere using a pocket watch and the sun. The sun rises in an easterly direction and sets in a westerly direction regardless of where you are in the world, however in Australia it rises/sets generally southeasterly/southwesterly in Summer, or generally northeasterly/northwesterly in Winter. Like the sun, the moon rises/sets in a generally easterly/westerly direction. For more precision, keep in mind that the moon’s orbit makes it appear generally opposite the sun from the perspective of an earthbound observer. In the southern latitudes of Australia the Southern Cross (constellation Crux) method was used to find south. There are several methods for finding the South Celestial Pole using the Southern Cross, but the most common, shown below, uses both the Southern Cross and the two pointer stars. Imagine a line connecting the two pointer stars. Halfway along this line, draw another imaginary line at a right angle to it and extend this off into the sky. Draw another imaginary line through the Southern Cross lengthways and also extend it off into the night sky. Where the two lines meet is the South Celestial Pole. Now drop another imaginary line down to the horizon. This is True south. This method relies upon knowing the direction the wind blows from in a particular area. This can be ascertained by observation practice, or from the vegetation. In sparsely vegetated areas especially, trees will usually bend ever so slightly with the prevailing winds. Air from the south will often be cooler than air from the north and wind often blows in from the ocean during the day and towards it in the evenings. These cues, when combined, provide a generally accurate method of direction-finding as long as you have an idea where the ocean lies and you’re within a couple of hundred kilometres of the coastal strip. Much like today’s average bushwalker, the old-time swagman never usually travelled off-track through thick scrub, but if he did, it would have been unusual if he ever became really bushed (lost). Reason being, all that time spent travelling through the country at walking pace gave him an acute eye for the little things, a break in a ridgeline there, a gentle slope there… If you find the watersheds and where they drain, then follow them down hill. Water always drains into more water so eventually you’ll hit the coast, and the coastline where major waterway drain into the ocean is usually populated, or at least visited fairly regularly. The chances of running into a settlement, road or even a decent sized town while making your way to the coast are very good. Often, a page torn from an atlas was the only form of map available. Some atlas maps included towns, roadways, major pastoral stations, waterways and borders, but they were large scale and usually didn’t show mountains, vegetation types or other useful features found on proper topographical maps. As with most maps, the top of the map was usually true north, which allowed a rough orientation to the ground using a pocket compass or an improvised compass rose despite the lack of a useful-scaled grid. 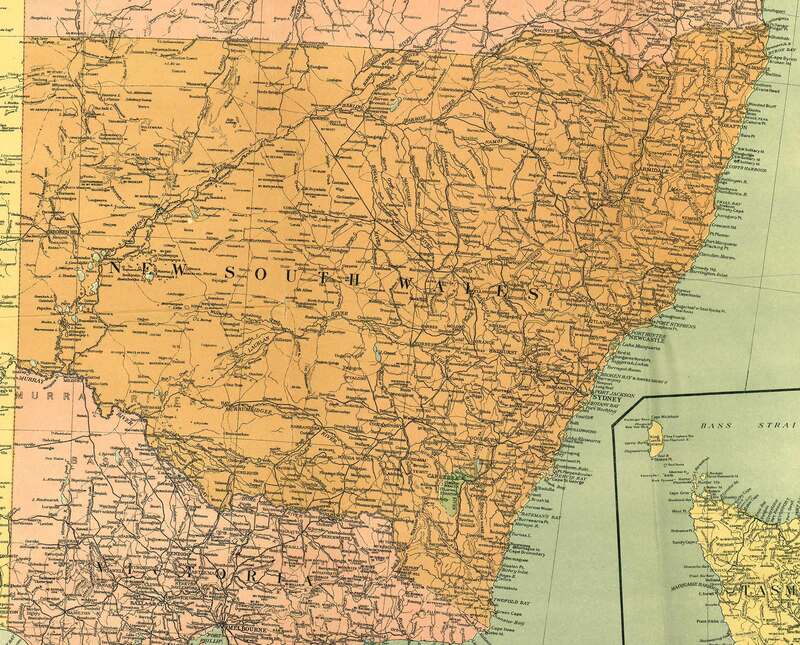 Map of New South Wales, Victoria and part of Tasmania from the 1916 edition of the Official Year Book of the Commonwealth of Australia. Torn from a book or atlas, this was the type of printed map most commonly available to swagmen and other bushfolk. Click on the map for full size. My Hunter-cased pocket compass with a printed paper Royal Geographical Society pattern card as used between the 1870s and the 1920s. Don’t get this one wet. A pocket compass, while nowhere near as precise as a proper prismatic surveyor’s or military compass, was accurate enough for general direction-finding. In use, the compass is opened out flat and a sightline is taken to a distant landmark with the direction on the dial noted. The line of march is noted and while walking, the compass is used as a guide to stay on a relatively straight track, sighting off trees, white ant hills or other landmarks as you go. The closer together your landmarks, the more accurate your line of march. My dalliance with that other site wasn’t as successful as I’d have liked, so I’m transferring the more interesting of my posts over here to where they are more suited. The pocket-sized Schmalcalder prismatic compass ready to use, with lid removed, front sight vane in position and prism flipped up. 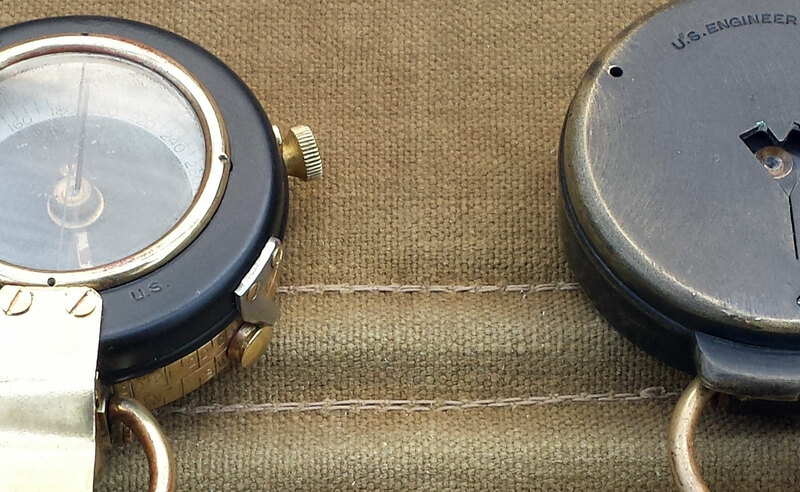 The first is a good look at an unusual compass from the late 19th Century. One of the first prismatic marching compasses, it’s the sort of thing Baden-Powell or Burnham may have carried during the Matabele Campaign. Through my recent eBay adventures, my vintage compass collection has increased dramatically. Some of my favourite new acquisitions are a pair of 1918-vintage US Corps of Engineers military marching compasses both made by Cruchon & Emons in Switzerland. These are the types of compasses that Horace Kephart might have used.